VSE has an extraordinary history of providing integrated enrichment programs for classes at all grade levels. From art, writing and music residencies, poetry festivals, inter-island collaborative events and much more, VSE has enhanced the education of our children since 1999. 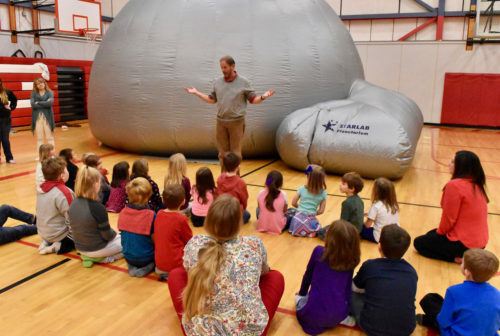 John Meader brought his magical inflatable super-dome planetarium to the Vinalhaven gym for one day in the deep of February, and took students on a trip to the planets, start, galaxy and beyond. There were three programs: Stars (middle school), Earth, Our Place in the Cosmos (gr. 3-5), and Our Family in the Sky (K-2). Each program was totally age-appropriate and engaging. All aligned perfectly with curriculum. John had a good way of describing things for each age group, with cultural references that were appropriate and relatable for kids in Maine. It helped students connect and absorb the information. This is a return visit for Northern Stars. VSEC invites John every few years so that students can experience different programs at different ages. Many students asked when he was coming back. Some of the older students remembered the dome from 2015. Others can look forward to seeing it again in 2022! 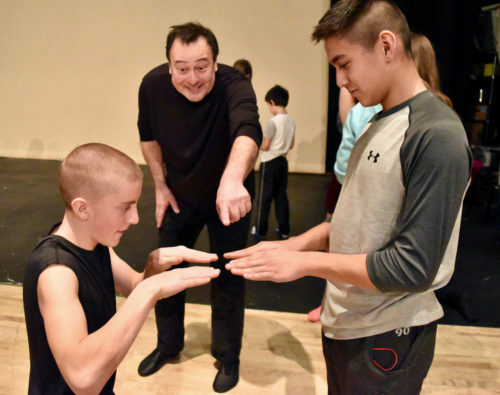 Leland Faulkner, Maine actor, mime and magician, spent three days at Vinalhaven School during late January 2019, and his visit couldn’t have come at a better time to liven up our School in the dead of Winter. His performance, World of Wonder, was magical, showing us amazing things you can do with your hands (shadow play), paper (origami), and storytelling (magic). He was an excellent, inspiring teacher, with theater games and physical theater activities that were fun and engaging for all ages. Annegret Baier is a master percussionist who teaches West African drumming and performs solo and with several bands around New England. 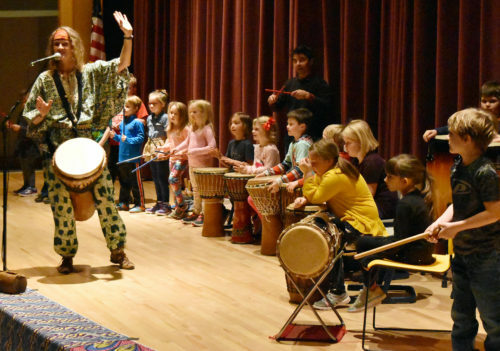 She came to Vinalhaven School from November 28-30 for a wonderful three-day and worked with students in Grades K-12 in learning all about West African drumming, rhythm, and culture. Annegret introduced the students to specific rhythms and brought an enormous array of drums from Gambia and Ghana. As part of the residency, high school music students performed some wonderfully complex music at the Student Recognition assembly with Annegret. The following day there was a special assembly for K-5 students that gave them the opportunity to perform on the stage with Annegret and teacher Bill Trevaskis. They did such a good job! Annegret performed solo as well and “wowed” everyone with her incredible musicianship. We were pleased that parents and members of the community also came and enjoyed the assembly. This is Annegret’s second residency at Vinalhaven School. Her first was in 1997, in the old school, almost 20 years ago! Click the below links to see what exciting programs Vinalhaven School Enrichment has had in years past or to view our gallery!